Citing costs and technology readiness concerns, Georgia School Superintendent John Barge announced Monday that the state would not be using standardized tests in reading and math developed by the Partnership for Assessment of Readiness for College and Careers (PARCC), the Atlanta Journal-Constitution reports. Earlier this month, Oklahoma dropped out of the multi-state testing consortium as well. The PARCC tests are designed to be administered online, and in addition to the cost, many districts, even in states like Maryland and Florida, are worried they won’t be able to schedule students into computer labs to take the tests and that bandwidth and server volume might create problems during the test administration and frustrate students. Even though Oklahoma announced it was leaving PARCC on July 1, the state is still listed on PARCC’s website as a participating state. This reflects a lack of professionalism, a lack of openness and transparency, and an attempt to hide the truth from the public. And of course, the website still lists Georgia, here (retrieved July 25, 2013). Also, didn’t Pennsylvania and North Dakota pull out of the consortium? The states are still listed among consortium member states. This is getting ridiculous. PARCC can’t even manage its own website and keep it up-to-date. Things like this fan the flames already brought by school superintendents, politicians, and educators over the PARCC assessments, and Achieve and its vendors are no doubt working to get a handle on the work PARCC is doing. They have their hands full, I would imagine, with test question databases, reports to the schools or parents, and examiners’ manuals for schools to use that will assist them in administering the test. For example, the consortium announced just today the release of the first edition of the accommodations manual, which is designed for students with disabilities. The manual is essentially a compilation of accommodations already being provided for students in PARCC states, but still, producing a document like this after only “two years of focused work” is a feat. Two years. To compile what already existed. Argh! There were rumblings earlier this week that Florida might want to drop out of PARCC. The president pro tempore of the state senate and speaker of the state’s house wrote a letter to the state’s education commissioner. In the letter, they asked that the state withdraw from PARCC. Between you and me, Florida probably won’t pull out of PARCC. It was pretty much the original state in PARCC, and all the contracts and bids for work on PARCC were drafted through Florida’s Department of Education. The state has such a vital role in the consortium that it’s unlikely to pull out, but this remains a possibility, as it does for Indiana. Moreover, the tests will be less expensive for Florida than the state’s current test, known as the FCAT. But apprehension about the tests, for which Florida still says it doesn’t have the bandwidth or a sufficient number of computers, is creating a small stir, as this article in the Miami Herald reports. 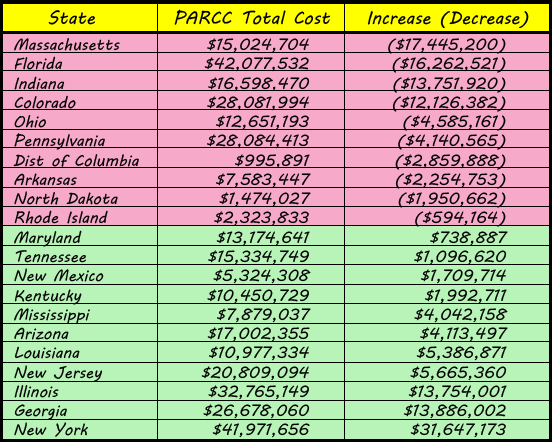 Maryland is likely to break even as it switches from the MSA to the PARCC tests, since PARCC tests are estimated to cost $29.50 per student and Maryland’s MSA test costs the state between $28 and $32 per student. For Illinois, however, as with Georgia, the cost of testing will increase with the PARCC tests. Georgia currently spends between $10 and $12 per pupil, and Illinois spends between $14 and $16 per pupil on tests used for accountability purposes. Total testing costs are expected to increase for more than half the states in the consortium, Education Week reported (also see table above).